I cast this new pair of socks on the evening of Jan. 1. The yarn is Lollipop Yarn Quintessential in Purrfection, the yarn I bought in memory of Posey. I broke open some new needles I’d had lying around, too. They’re Knitters Pride Nova cubics Platina, a set of square dpns, and so far I’m enjoying knitting with them. I’ll need to go down a needle size for the foot, but for the leg, the 2.5mm needles are working. 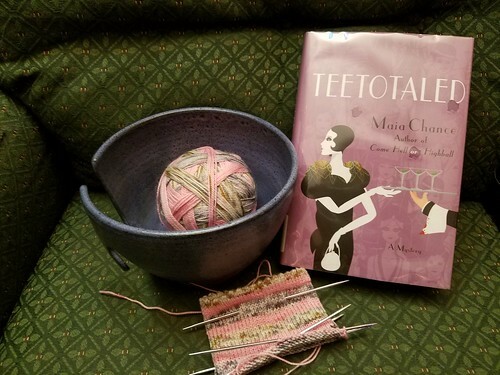 I had mentioned a few weeks ago that Maia Chance’s Teetotaled was on my list of books I wanted to read this winter. Yesterday, Bridget mentioned she’d read the first book in the Discreet Retrieval Agency, which put the series (about a widowed society woman from 1920s Long Island who, when she finds her scoundrel of a husband has left her penniless after his death, turns, with her Swedish-born former cook, to detecting) in the front of my mind when I headed to the library after work. Lo! There was the second book in the series on the shelf, and I’ve already plowed through a third of it tonight while knitting. Such a delightful, addictive read. I am also reading Turtles All the Way Down and The Unbreakable Code and have started listening to The Pirate King’s Daughter. Lincoln in the Bardo‘s audiobook has come back up for borrowing, so I’ll give that one more shot in the next few days. You can visit Kat for more posts on yarn and books. I love the Posey Yarn! It is beautiful! And, that looks like an interesting book to begin your January! Happy Knitting and Reading!